One of the star inside-lefts produced by independent India was Pat Jansen, a captain of Bengal. An exciting player to watch - energetic, vibrant, fast and clever - Pat Jansen had a fine sense of anticipation and positional play. Jansen had powerful wrists, and was a strong and accurate finisher who could send the ball crashing into the net from any angle. Top scorer Pat Jansen, captain Kishan Lal, and Balbir Singh Sr. were the outstanding forwards in the London Olympiad, and left no doubt in anyone's mind that India would retain the Olympic hockey gold. Writeup and photograph courtesy Wills Book of Excellence - Hockey. 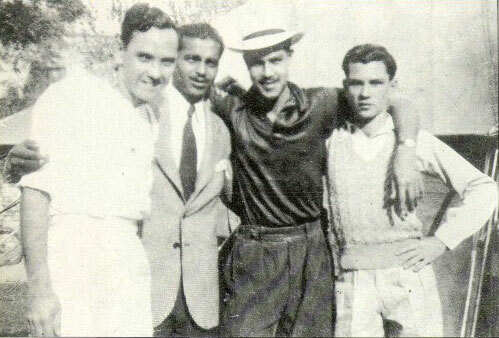 From left to right are Pat Jansen, K. D. Singh 'Babu', Keshav Dutt and Leslie Claudius.